April doesn’t look like this around here. Even though it’s gray, rainy, and ugly, I ran into a forsythia hedge with tiny buds. 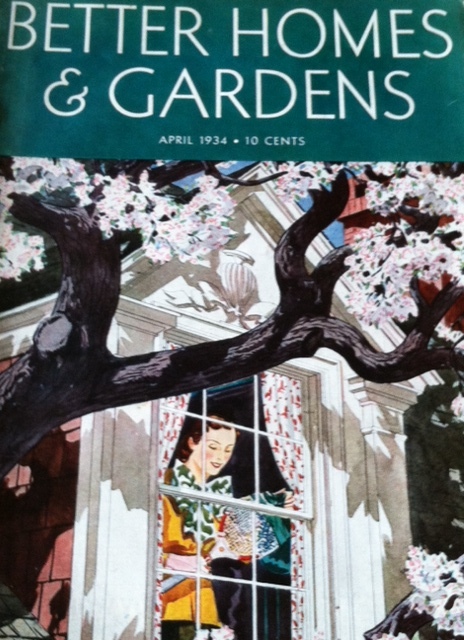 This entry was posted in Minimalist and tagged April, forsythia, old magazines, ugly time of year, waiting for spring. Bookmark the permalink. Yes, and in April, 1934, Americans everywhere were waiting for Easter to be able to don their sporting whites and join their pals on the court for a smashing match of lawn tennis. That is, if they weren’t planting their gardens to have something to eat, or watching the bank foreclose on their farm, or standing in soup lines, or wondering if the bank that closed and took all their money would ever re-open, or hoping for a WPA job that would take them to some sinkhole out in the Great American Desert to work on something that would let them send some money home to their family. So they were pedaling lies and fantasies back then, too. OTOH, when was the last time you saw an American house built with such simple, classic and admirable lines? The contrast between the fantasy peddled and the simple grace depicted is worth considering very carefully. A day without LP is like a day without fish oil.